The 77-member St. Petersburg State Academic Symphony Orchestraslipped into Philadelphia for a one-night-only Russian repertoire spectacular that went almost unnoticed, with only a couple of hundred people filling the center seating in Verizon Hall. Chinese pianist Xiayin Wang, may have been the main draw for those who came, but those in attendance were about to hear an evening of virtuosity: not only from the soloist, but the full orchestra as well. St. Petersburg Symphony specializes in Russian rarities, but this is not to say that it doesn’t have artistic command and interpretive clarity of its country’s classical hot list. Conductor Alexander Titov immediately unveiled the huge character of this orchestra with a glittering performance of Glinka’s overture to “Russlan and Lyudmila.” This was a musical champagne, caviar and vodka of engulfing esprit as the lead in to the central work. Wang, so elegant in a sleek silver satin gown, was all business essaying her driving version of Sergei Prokofiev’s Piano Concerto No. 3 immediately inside the drama and mystic of the solos passages. Wang is not a showy player and her performance was quietly intense, as she hovered over the keyboard, locked in an intense musical zone. Wang drove the orchestra in the opening and languished with immediacy in the second movement’s haunted, broody piano lines to abstract voids. Even with erratic volume on the interlocks with the orchestra, Wang didn’t back away from the darker atonal lines, not to mention those echoes of Prokofievean waltzes. This was a thrilling performance. How to top that? Floating the titanic structures of Tchaikovsky’s Symphony No. 4, Titov seemed so immediately connected to every contour of its symphonic grandeur and attendant to all of the subtleties. His pacing was a fevered gallop; the cascading crescendos burst open, without a cloying buildup. Throughout the performance, the players brought forth cultural markers, deep understanding of the composer and Russian musical DNA. The horns were huge, forceful and, at times, retooled Western templates of the composer’s romanticism. Standout also in in the woodwinds by Iurii Novichenkov (oboe) and Andrey Simonov (bassoon), conjuring all of the mysticism in the Russian folk lines. The flute flights played by principal chair Natalia Danilina were soaring instructive heralds, another example of period authenticity. Framing all of this was engine of St. Petersburg’s mighty string section, just pulsing throughout and contrasting the pizzicato movement as an intimate Tchaikovsky divertissement. From start to finish, maestro Titov was in towering command of this masterpiece. You can only hope that this orchestra ignores that they were ignored by classical fans in Philly and come back. 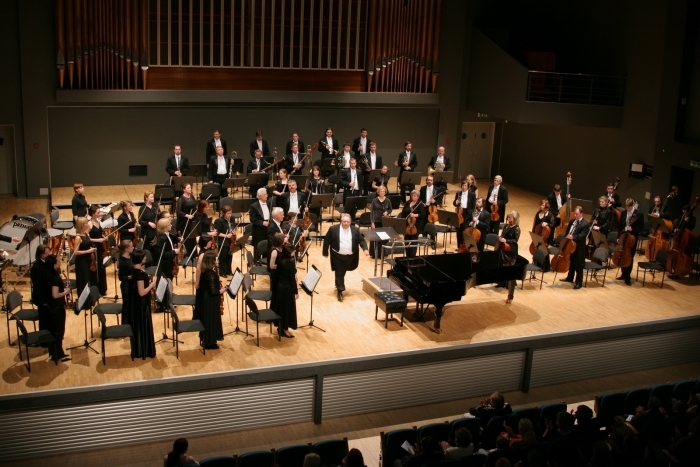 Meanwhile, St. Petersburg Symphony Orchestra finishes its extensive tour in several U.S. cities and South America.